I want to win, so this is my fair warning to all other potential applicants. This is a new, totally made-up and completely irrelevant contest to see who is the most inept, seasoned mother who really tries, but who often falls short of “Mom of the Year.” Think of it like the Darwin Award… without the unfortunate, untimely death of the winner. I had one of those days today where I caught myself posing like a mom, but when I looked harder realized that I wasn’t doing that great of a job. Like when I was holding my four-year-old by her ankle and lowering her down the back of the dryer so she could retrieve some clothes that had fallen there. She brilliantly requested to have herself turned around so she could grab them with her feet. Or, when I was so happy about the hour and a half I spent ironing the patches on the Brownie vest and after double, triple and quadruple checking the troop number, ironed them on in the wrong order. For any other moms who ever do this, they can be melted off and re-ironed. My resume’, for those of you thinking that you may have what it takes to outdo me, extends much further than today. Like yesterday when I took the kids to the local Great Clips to get their haircuts. My girls, my beautiful girls, who are stuck with a mom who doesn’t even comb her own hair, took off their hats to the horrified looks of the hairstylists. Both girls looked like they had just stuck a fork in the electric socket and, having survived the jolt, retained every particle of energy in their hair. “Do you condition your hair?” One of the stylists asked Haley, as I cringed for her honest response. “How about brushing it?” I thought to myself that I have requested that she do that… at least a couple times. Let’s just say that we walked out of the salon with tamed hair and a bag filled with about $40 of moisturizing shampoo and conditioner. I guess it wasn’t just a winter thing. It really is unfair to my girls, and I guess my heavily-haired boy too, that I don’t really care about hair. I mean, I do care about it, and I enjoy having it on my head, but even after spending a ton of money on my own, it ends up in a hat or pony tail anyway. That is why I have vowed to NEVER-EVER-UNDER-ANY-CIRCUMSTANCES-CUT-KIANA’S BANGS AGAIN. 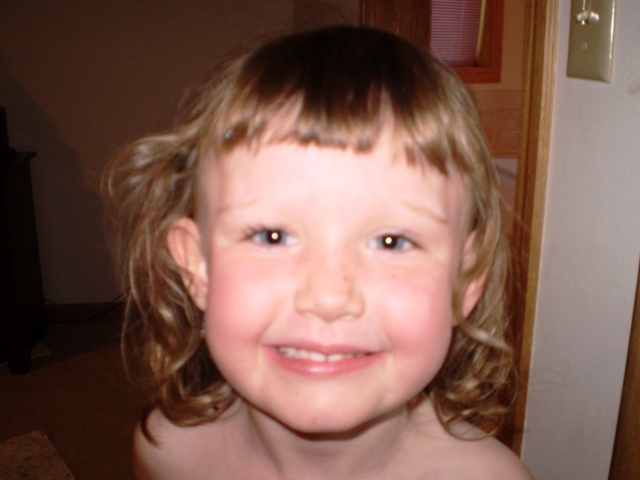 She is the one pictured, and that is what her hair looked like TWO months after I tried to be a good mom. So, that most definitely will put me in the running for Best Wanna-Be-A-Good-Mom of the Year. The absolutely defining moment of my parenting prowess, however, came over Thanksgiving break. Kiana, who is now thankfully wiping herself, had told me, as usual, that she was going to the bathroom and that she wanted me to come help her. I got to visiting and got entirely caught up in a totally unimportant conversation, when I heard a blood-curdling scream from the bathroom. She had probably been in there, on the pot, for nearly 15 minutes, and I never heard her cries for help. You may call that abuse and neglect, but I call it tough love…and now she doesn’t even need my help any more. ***Don’t worry…we save simultaneously for college and counseling, and as confident as I am in winning this contest, I do truly try to be a good mom.